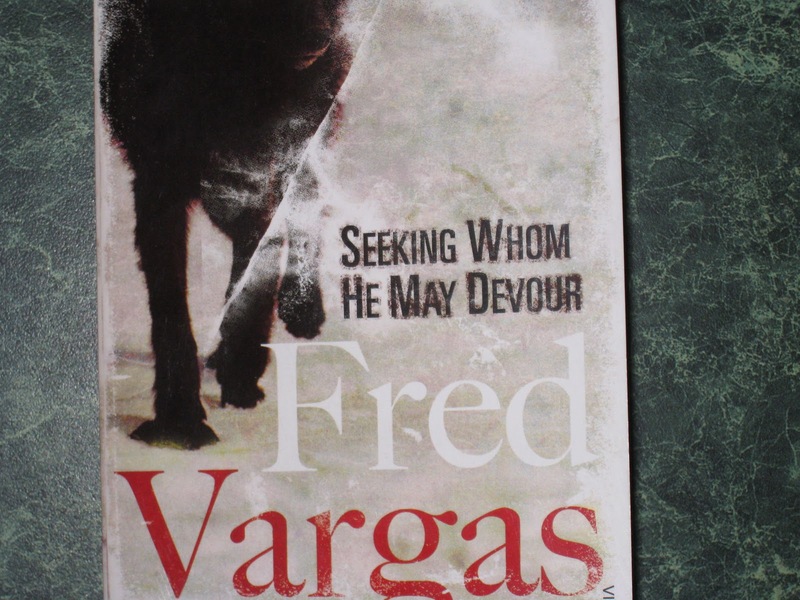 The Little House of Concrete Bookshelves: Fred Vargas "Seelking Whom He May Devour"
While you expect your fictional detectives to have the odd quirky foible, Fred Vargas' Commissaire Adamsberg takes the biscuit when it comes to extending quirks and foibles into genuine eccentricity. Vargas (a.k.a. French historian, archaeologist and authority on the epidemiology of the Black Death and bubonic plague Frédérique Audoin-Rouzeau) seems to specialise in odd characters, with her other series The Three Evangelists involving three historians, specialising respectively in prehistory, medieval life, the Great War (an odd mixture in itself), sharing a house known as The Disgrace with retired Commissaire Old Man Vandoosler, a mixture that doesn't sound anywhere near as off the wall that it turns out to be. There's only one Evangelist story translated into English, so apart from The Three Evangelists, which has definite oddball appeal, if you're looking for a genuinely off the wall read you're probably going to be heading for the Commissaire Adamsberg books. He's not quite in the same league as the National Coroner of Laos, but Adamsberg, a practitioner of Zen and the art of solving murder mysteries has raised the bar when it comes to inscrutable eccentric investigators, aided in his efforts by the more methodical Danglard, an ideal candidate to carry out the leg work that allows Adamsberg to come to the instinctive solution to a problem anyone else would be inclined to dismiss as insolvable. Musician and plumber Camille Forestier, an avid reader of The A to Z of Tools for Trade and Craft drifts in and out of the stories, providing the means to link Adamsberg, busy in Paris avoiding a prostitute intent on murderous revenge after he very accidentally killed her pimp, with a chain of slaughters and savagings that start in the mountainous Mercantour National Park near Nice and may or may not be the work of a werewolf. Camille, having taken up with a Canadian expert on wolves, is in the mountains with him when debate whether the mutilated sheep being found across the Alpine pastures are victims of a marauding wolf or something more sinister breaks out. After farmer Suzanne Rosselin is apparently murdered by the rogue wolf or wolf-man Camille is enlisted to drive the sheep truck while Suzanne's adopted African orphan son Soliman, who has, it seems, swallowed a dictionary and elderly shepherd Watchee set out to track down the suspect, an outcast abattoir worker named Massart whose lack of body hair makes him, in the minds of the locals, a prime candidate for lycanthropy, since werewolves have all their hair on the inside. Massart may have disappeared, but wolf-watcher Lawrence Johnstone has found a map left in his house tracing a route across France to a supposed destination in an English slaughterhouse, and once the three avengers realise they've failed to track down Massart, Camille turns to her old flame Adamsberg for assistance, learning that he has conveniently wound up in Avignon pursuing another matter and lying low while avoiding the would-be avenger in Paris. Having run across one of the later Adamsberg stories in the local library and read The Three Evangelists, I had Fred Vargas on my list of authors to watch for, and Seeking Whom He May Devour confirms that Adamsberg's a character of genuine eccentric charm. I've got This Night's Foul Work on the waiting to read pile, so it's a case of chasing down copies of The Chalk Circle Man, Have Mercy On Us All, Wash This Blood Clean From My Hand and An Uncertain Place to round out a series that is a definite keeper.